March 19, 2013 – Principal and Client Guru of Newton, Rob Neumann was a special guest on “The Price of Business” Radio Show hosted by Kevin Price. Rob gives an insightful look into the “Hieracrchy of Marketing. Click below to listen to the interview. Social search is a serious topic of discussion. The SEO world, and search in general, has moved away from link building as a stand-alone practice, and many online marketers see the future in Page Likes, Retweets, +1s, pins and Channel subscriptions. At SES New York, Bing’s Duane Forrester talked about search engine’s continued efforts to reward sites for creating great user experiences – through content marketing and intuitive user designs. In the same session, Dan Cristo, director of SEO innovation at Catalyst, spoke about how social cues and interactions influence online behavior directly and indirectly. He highlighted some notes on the impact Google+ members searching the web for content – a subject Bing steered clear of. SEO boils down to two things: Relevancy and trust. He reported that SEO boils down to two things: Relevancy and trust. Why do social cues and recommendations matter so much to search engines? Cristo hypothesized it’s because certain queries just cannot be answered by the web – no matter how intelligent crawlers and developers get. But these questions CAN be solved by friends and family. For example, consider the query, “Who should I vote for?” The web can offer a bevy of results suggesting who Cristo can vote for (no matter the election), but his social connections likely have similar views on politics, and can point him toward the right direction. If these people have made their own leanings clear online, that’s where search engines come into play – technology allows the categorization of data based around these interactions. Cristo said, “Every strategy has three distinct elements: Goals, Objectives and Tactics.” All of this hinges on a website’s ability to create high-quality content – brands have a responsibility to produce content that engages their audiences. This will inherently boost website conversions, and subsequent interactions and social shares will tell marketers MORE about their customers. On to insights from Bing! Everyone knows social is important, but HOW important? Bing’s Senior Program Manager Duane Forrester expanded on the value of social listening and how it plays into search. 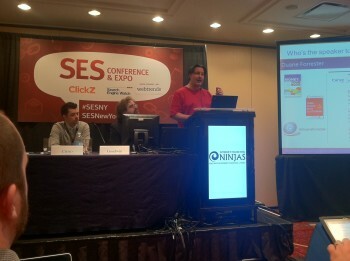 He compared today’s social SEO market to that of traditional SEO ten years ago. Metadata, title tags, etc. were once the gold standard of SEO, but now they’re the base line. The reality: If there is a big collection of people talking about a person, search engines are drawn to the person or site to try and understand what all the fuss is about. Unfortunately, the technology to truly hone in on these conversations and chatter remains in infancy. Imprecise results – one in four searches delivers successful results. Refinements – forty-two percent of sessions require refinements. Lengthy tasks – forty-four percent of page sessions last a day or more. Forrester paused, and focused on the term “sessions.” He asked, “How many of you focus on queries, and not sessions?” Many SES NY attendees raised their hands. He continued, “A query is a single action, but a session is a collection of related actions that take place over time.” Sessions help brands uncover search behavior patterns and highlight points that compel internet users to convert. It’s essential for web marketers to evaluate a variety of data throughout social listening, especially in conjunction with SEO and search. Review semantic search trends, research patterns and consumer personas. The more companies know about their prospects, the better they’ll do long term…obviously. Search has changed, and so have internet users. New devices demand different search experiences and make community connections around SERPs easier, even on the go. Brands must consider voice, picture, gesture and sound display – as well as connections with constantly searching audiences that can bring them closer to top of results on smaller screens. Bing and Google continue to build a universal world of search, and companies must immerse themselves in the culture because the ROI and benefits are really real – but only when the connections are meaningful. Companies must immerse themselves in the culture of SEO and search because the ROI and benefits are really real – but only when the connections are meaningful. “Autofollow is not your friend,” he said. When Bing sees that a user is “following” thousands of accounts, it doesn’t give the impression that a person is actively consuming and engaging responses from the followed accounts. On the other hand, those who have a lot of followers reveal in-demand voices. Instead of trying to artificially create a high-volume of contacts, nurture real relationships to build a following. While Forrester suggested that Twitter data is not a direct ranking signal, Bing works with third parties for more social data to determine people’s intentions. Real-time engines want fresh content, fast. Integrated social signals influence click actions. Social signals remain only a few thousands of signals for organic ranking. How does Forrester advise listeners on creating a better search experience? “Take money out of SEO, paid search, and put it toward usability testing.” He continued, “If you really want to attract search engines, amaze your customers with quality content.” This content must inspire social chatter, and to better understand what drives more conversation, a company’s social team must be connected to various departments, so insights can fuel results. Forrester reminded marketers that great content is what SEO is really all about. It’s the glue that drives relationships for social influence on the web. “Is your content quality? You don’t know – that’s up to your audiences,” he said. Quality standards are something marketers can work toward. Attempt to put good, editorial, polished information and ideas out there – but people decide what quality is, and search engines follow what people want. People decide what quality is, and search engines follow what people want. Forrester capped his session by talking about the importance of share of voice over keyword reports. SOV shows continuous growth, and it paints a more realistic picture of search and social ROI. If a professional works hard to make it to the first page of SERPs for a specific keyword, that’s great – but the only place to go from there is down. Companies must advance how they measure their web presences’ success to show long-term results. What’s the deal with social and search? Social listening can be a shallow practice. Companies may hear what their customers say online, but they rarely respond effectively. More, brands often overlook how to leverage what they pick up on Twitter and Facebook. Cristo and Forrester both presented cases of why social will become an even greater asset for companies, and it all relates back to the user experience. Quality content is the cornerstone for your internet marketing agenda, but don’t stop with written-text – social media and other engaging information are all part of the content experience that amplifies branded products and missions. We’re here to help small businesses, and while our mission focuses on getting cash in the hands of small businesses quickly, our team is dedicated to helping small companies grow in every way — including web marketing. Today’s topic is search engine optimization, or SEO as it’s now better known. Search traffic is attractive to businesses of all sizes for many reasons. But perhaps the biggest is that search traffic is “free” traffic, in that you don’t have to pay for it directly like you do other channels such as PPC, display ads, public relations and other channels. So here are 5 important SEO tips for small businesses. 1) Be realistic. For example, if you’re a merchant who sells previously-owned vehicles, there is almost zero chance you’re going to rank first for the search term “Used Ford Trucks.” Not unless you spend years and years investing your time and efforts in making this happen. And even then you’ll bump up against much larger operations who have also spent years and years targeting the same term. The word “free” as it pertains to SEO traffic is in inverted quotes because there is the sunk cost of investing your time creating all the content and getting all those links. 2) Target mid-tail terms. You’ve possibly heard of the long tail by now; it basically means scooping up many of the searches that no one else is ranking for. For example, if you can finish first for “Best Place to Find Inexpensive Ford Pickups in Boise, Idaho with Bad Credit” — great! That’s likely one more person on your site every day. But only one. Time would likely be better spent going after a mid-tail term like “Used Ford Trucks in Boise Idaho.” Ranking first on this term could bring you 25 visits every day; this is substantially more efficient than trying to rank first on 25 different long-tail searches. 3) Call in favors. It’s okay to admit you have web friends. We all do now. Ask your network to “like” your company page on Facebook, to follow you on Twitter and to link to your site from their blogs. Social signals are now huge when it comes to SEO; in fact you should view your social media strategy and SEO plan to be one in the same to drive organic traffic to your site. 4) Write good stuff. Everyone knows crappy SEO content when they see it — such articles are written for bots, not humans. Google and Bing are really cracking down on this low-level content, and the best thing you can do is to create content pieces that people will share. Adding social media share buttons with also helps this process. We recommend Twitter and Facebook buttons as the standard, while also including budding platforms like LinkedIn and Pinterest. 5) Be patient. SEO channels aren’t built in a day. If and when you start working on it you should be committed for the long haul. We’re talking years, not months or weeks. Because of the quality and quantity of traffic at stake, SEO is extremely competitive in almost every single vertical imaginable.